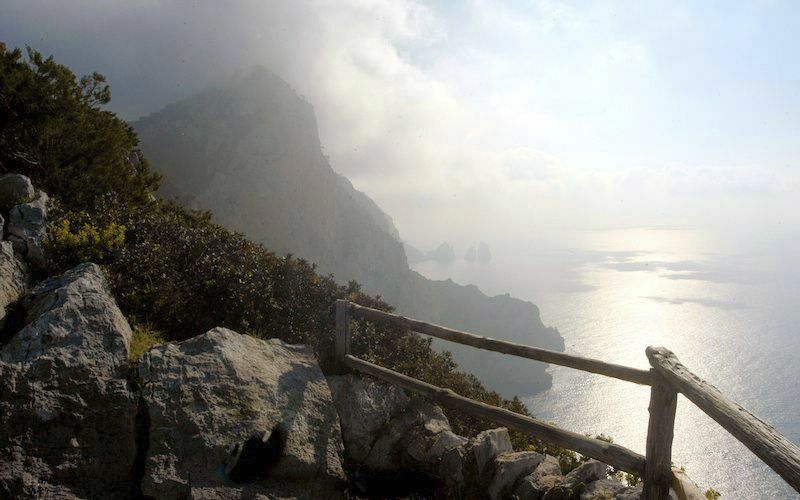 Breathtaking views and crystalline waters: these are the high points of this walking itinerary down the stairs from the Torre della Guardia watchtower to the Punta Carena lighthouse, one of the most beloved beaches on the Island of Capri for its unique position along the coast, which lets you savor the sunset over the Mediterranean. 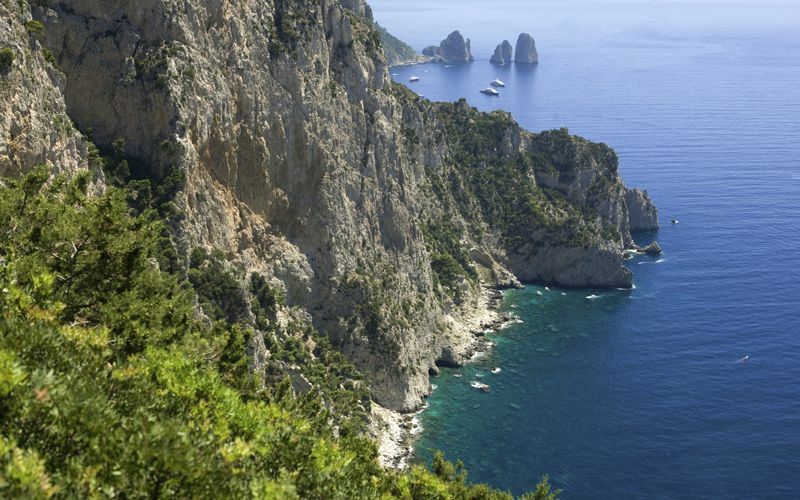 This walk can be stretched out over an entire day and leaves from Anacapri, the second largest town on the island which can be reached from Capri by public buses which depart every 15 minutes. 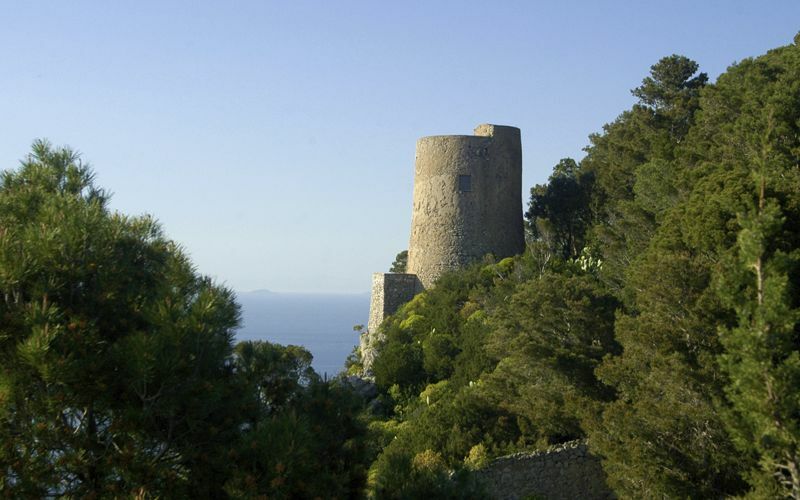 There are two alternative initial routes to reach Torre delle Guardia, and from there continue on to Punta Carena. This is the longer route, passing the Migliera and stopping at the scenic overlook facing the Faraglioni. 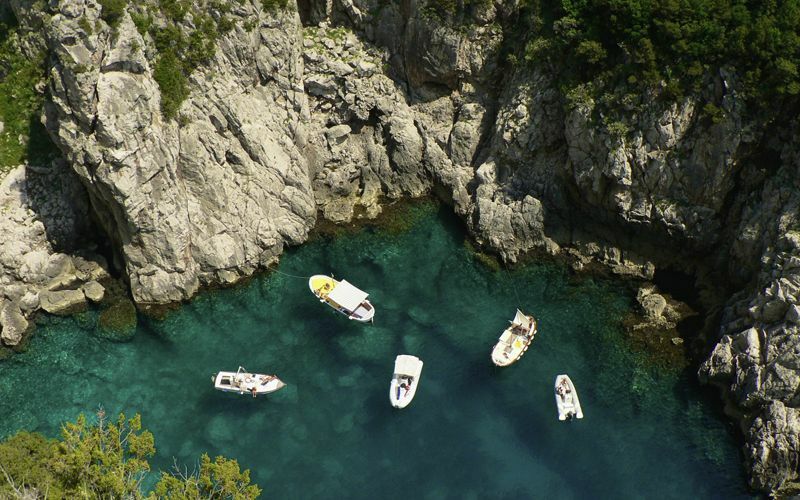 From the bus from Capri, get off at the "Il Cimitero" stop and walk along Via La Migliera, which passes through cultivated fields and vineyards, with views of the Mediterranean as a backdrop. The walk (around 30 minutes) ends at the Belvedere del Tuono scenic overlook, one of the most beautiful on the island, with rocky pinnacles stretching into the distance to the sea. 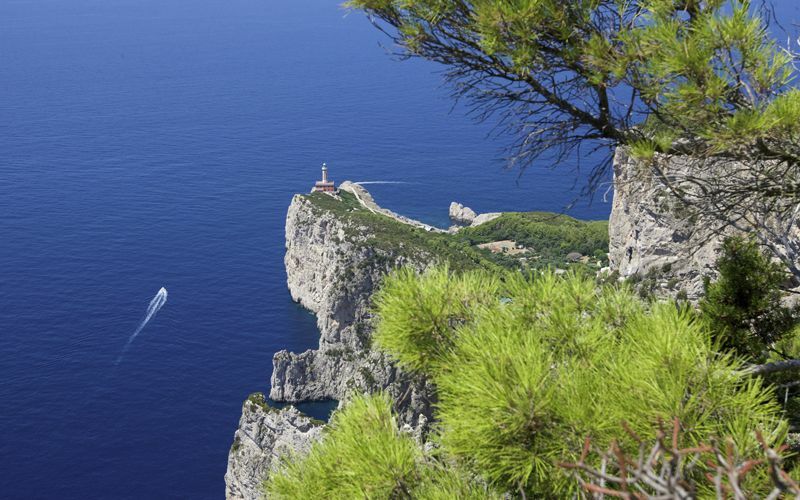 Take the short uphill trail, passing first a small shrine to the Madonna and then a large iron cross, and you'll come to a second breathtaking scenic overlook facing the sea and the Faraglioni di Capri. Walk back to the Belvedere del Tuono; on the right (facing the sea) there is a trail with some rough stretches that skirts the mountain slope and ends at Torre della Guardia (around 20 min. ), where you can take the stairs down to Punta Carena. At the Migliera, the Da Gelsomina restaurant has a large pool open in the summer, and nearby the Philosophical Park has a tree lined path marked by a series of tiles with quotes from some of the greatest thinkers of Western philosophy. This is the shorter route, along Via Vecchia del Faro. 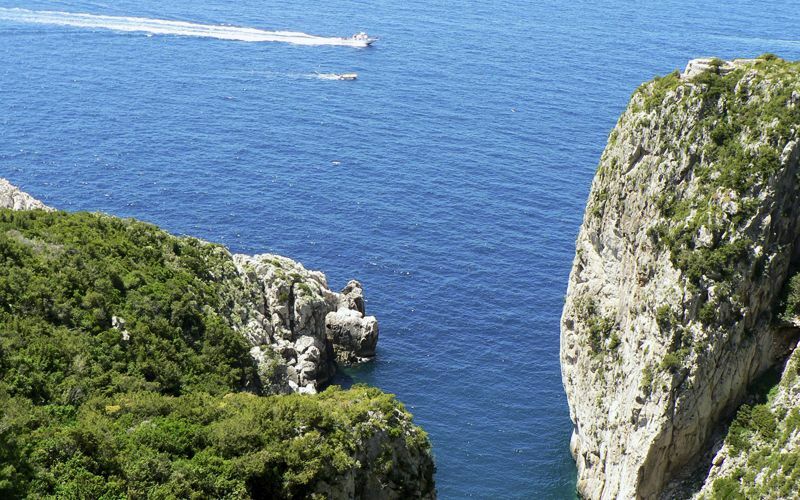 From the bus from Capri, get off at the last stop in Anacapri and continue on foot along Via Nuova del Faro. At the end of the road, about 5 minutes on foot, take Via Vecchia del Faro at the bottom, a small lane to the left. Continue towards the insection with Via La Guardia and take a right on this scenic lane through the rustic area of Anacapri, where the town's country roots seem miles away from the mass tourism of Capri. 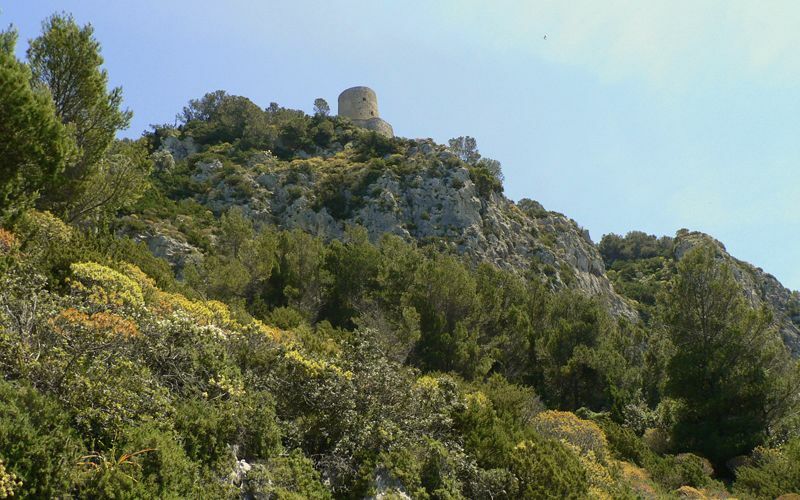 After about 20 minutes, you'll reach the Torre della Guardia, a historic watchtower used in the past to protect the waters off the coast. Next to the entrance of the tower, take the stone steps down the slope to the road at the bottom which leads to the lighthouse. 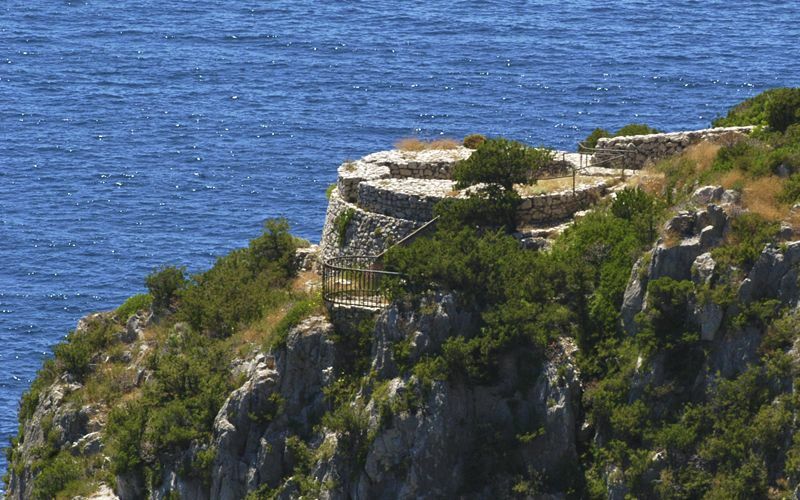 At the bottom of the staircase, before continuing on to Punta Carena you can walk up the road for a few dozen meters and take the trail to Fort Pino, another watch tower and small fort used to guard the coastline of Capri. Note that the climb back up can be tough during the hottest months of the summer. Otherwise, you can take the Fort Pino trail, but halfway down veer left long a shorter trail to Fort Tombosiello, with sweeping views over the Cala di Limmo and the Punta Carena lighthouse. 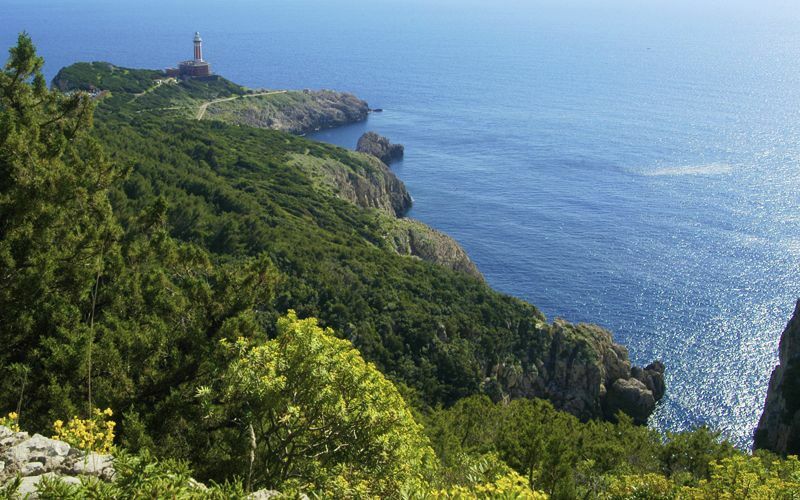 From here, turn back to the main road and continue on to the lighthouse (15 minutes) along the shortcut which passes through the pineta del Faro, or lighthouse pine grove. At Punta Carena, there is the Lido del Faro beach club and two traditional snack bars which serve delicious sandwiches. The Da Antonio snack bar is famous for its "caponata di Antonio". 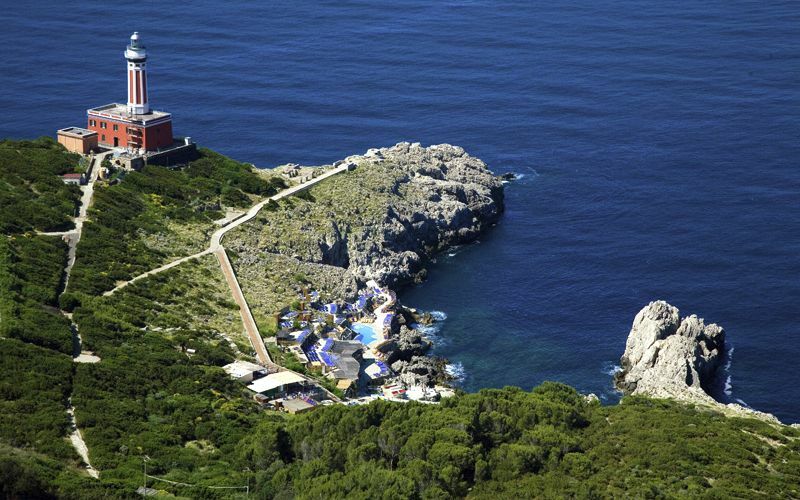 During the summer, the Punta Carena lighthouse is an unforgettable spot for a sunset cocktail or a dinner by candlelight overlooking the Mediterranean. Buses for Anacapri depart about every 20 minutes. To continue to Capri town, get off at the last stop in Anacapri and wait for the bus to Capri or to Marina Grande at the adjacent stop. Otherwise, you can always call a taxi (Anacapri taxi stand: 081 8371175).